The Fellowship was fortunate enough to obtain a copy of THE GREAT DIVIDE #1 from Dynamite Entertainment. The story is by Ben Fisher, with art and lettering by Adam Markiewicz, and colors by Adam Guzowski. It’s been a couple of years since “The Divide;” an epidemic in which skin on skin contact with an infected person causes the victim to suffer a quick, yet agonizing death. A young man is heading to the town formerly known as Winslow, and to a trading post that lies within. He’s attacked and robbed of everything of value. He finally reaches the post and finds that the dealer is also his attacker. A truce is made as his medical knowledge is needed. Things really go downhill from there. There are quite a few post-apocalyptic stories out there (most dealing with zombies), but this one has a different vibe to it. The premise certainly has me interested, and Ben Fisher’s script left me wanting to find out more. I really enjoyed the unique look that Markiewicz and Guzowski created for the book; it really works. Really worth checking out. 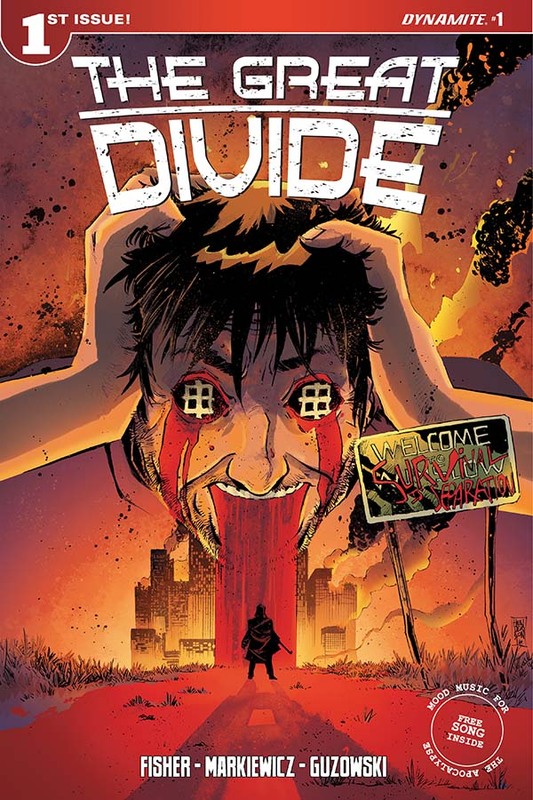 THE GREAT DIVIDE #1 is in stores now or available at www.dynamite.com.